For hard of hearing patients, we suggest that you add an e-pill Talking Alarm Clock ($64.95 / SKU 960543) “to make the Alarm Louder” on your e-pill MedTime STATION Automatic Pill Dispenser (patent pending). 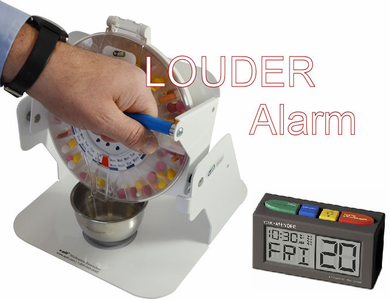 e-pill MedTime STATION / "Louder Alarm"
Record a message for each alarm time (if possible using the voice of “offspring” Son / Daughter). Turn Off the alarm sound (alarm sound = NO ALARM TONE) on the e-pill MedTime STATION. This e-pill® Medication Reminder (960543 e-pill MedCenter Voice 6 Alarm Clock) has two (2) volume settings. You would probably use the LOUD setting and it is recommend that you use the included AC adapter to power it. Walk over to the e-pill MedTime STATION when you hear the VOICE Alarm. Move the “Blue Handle Forward” to access all medicines for this event. Get a glass of water and swallow your meds. Press the “Big RED Button” on the e-pill Talking Alarm Clock to make it stop talking (ALARM Acknowledged). You may also consider buying the e-pill MD2 Automatic Pill Dispenser device (SKU 993019) which is much LOUDER and has longer alarm duration (“never stops”).